Ellen Kent has been touring opera throughout the UK and Ireland for 25 years, and shows no sign of diminished passion for bringing the grandest of art forms to places which otherwise would have none. She currently has productions on the road from Portsmouth to Dundee, and almost everywhere in between, of Nabucco, Aida, and Puccini’s evergreen tale of love and death among penniless 19th century Parisian artists, La Boheme. The cast, all from central Europe or Ukraine, is formed of mature singers with experienced stagecraft. 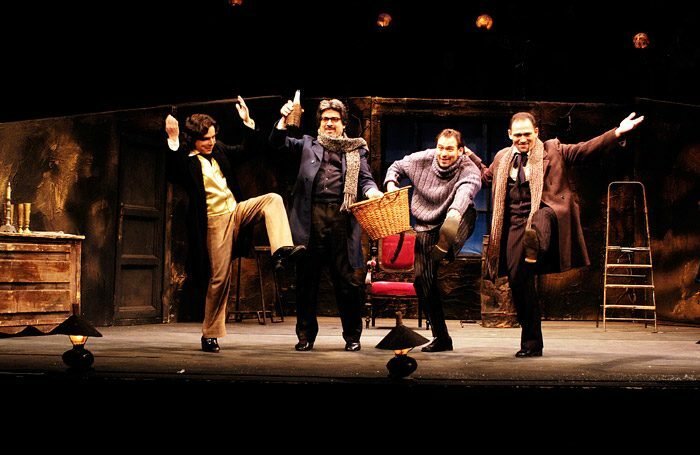 Vocal standard is high – the four Bohemians, especially Vitalii Liskovetski’s Rodolpho and Iurie Gisca’s Marcelo, would not disgrace the stage of Covent Garden. Though not the most youthfully energetic bunch, their clownish antics in the final act draw plenty of laughs. Alyona Kistenyova’s graceful Mimi and Olga Perrier’s glamourous Musetta fit the bill too. Kent’s direction is unradical but sound; the only small disappointment, despite a well-populated stage and Kent’s trademark live animal cameo (in this case local dog Molly), is lack of definition in the chorus milling in the Cafe Momus scene. The Act I and IV set consists of old-fashioned but effective painted flats of Parisian rooftops; the continually falling snow throughout Act III, and large gnarled tree, make more of an impression. The small orchestra, nominally the National Philharmonic of Moldova, is rough around the edges, but held together well by conductor Vasyl Vasylenko, who maintains a lively pace and authentic Puccini-esque sweep. Kent’s solidly traditional, musically dependable productions clearly perform an important, much appreciated service.